Designed with early learners in mind, interactive touchscreen tables are the perfect addition to nursery and primary school environments. Ranging from 22” through to 43” in diameter, these interactive touchscreen tables can accommodate up-to 4 children working together on a multitude of educational apps. Part of the new OFSTED guidelines, released in 2017, requires that children are introduced to a range of technologies, used in places such as homes and schools. They must identify, select and use technology for particular uses. Additionally, children need to explore and play with a wide range of media and materials, as well as providing opportunities and encouragement for sharing their thoughts, ideas and feelings through a variety of activities, including technology. The addition of a touch screen table into a nursery can be enough to show to OFSTED that your nursery is meeting the technological requirements. 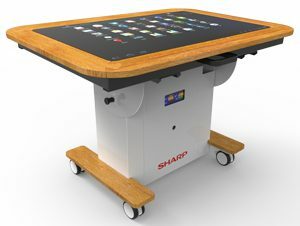 The robust aluminium and oak table frame includes a built-in PC within the Sharp screen, meaning teachers are one touch away from transforming the classroom into a collaborative learning environment. This interactive touchscreen table is designed to suit individual learning, group collaborative sessions as well as whole class learning, and allows the teachers to follow the complete Early Years Stage curriculum, from numeracy and literacy to letter formation and music. The displays come with toughened glass, which is ideal for the education environment. Additionally, all 4 wheels lock in place to add strength when in use, making it safe for any user, irrespective of age. Teachers can use interactive tables as presentation screens when in vertical mode, or as a hands-on activity touch table when horizontal. Optional branded surround to match your nursery / school’s branding.